Fans have been digging into the data of Dissidia Final Fantasy NT on PS4 – and their discovery suggests that quite a few more additional characters beyond the six promised for this year were at least planned. Final Fantasy fans on Reddit and Twitch appear to have made some interesting discoveries when digging through the game files of FF series fighting mash-up Dissidia Final Fantasy NT. If the game rip and following datamining is correct, Dissidia NT contains references to over ten characters not featured in the game at launch. 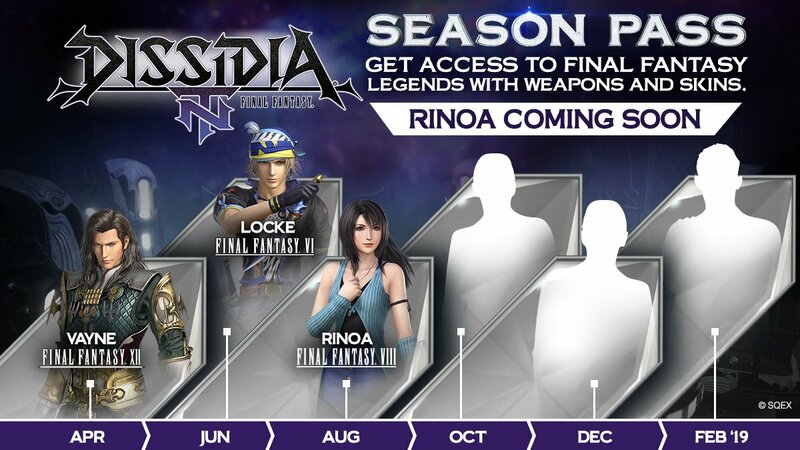 A couple of the characters referenced in the files have already been revealed as DLC – FF6’s Locke, FF8’s Rinoa and FF12’s Vayne – but the others are a mixture of all-new characters and returning characters from the PSP Dissidia titles. The names appear in a list of potential ‘manikin’ enemies. Manikin is the main enemy type encountered in the Dissidia series – they’re basically off-color, crystal-like palette swaps of the playable characters. Across all three Dissidia releases there’s not yet been a manikin for a character who isn’t also playable, so the fact that these characters are referenced within the game code suggests they were at least planned – and possibly, they may still be coming. The datamine also contains references to two new stages: “The Dominion of Rubrum”, which would be from FF Type-0, and “Lucis”, which would be from FF15. In the embedded video below Twitch user JC494 explores the game files – and seeing models and geometry opened in real time at least confirms the data fans are pulling from as legitimate. Three of the DLC cast are series newcomer men from the newer half of numbed FF games (FF8 – FF15). That means we’ve got two of these to go, since Vayne takes one of these slots. One of the DLC characters is a man from the earlier half of the series – that’s Locke. One of the DLC cast is a series newcomer, a woman, and from the later half of the series. We now know this to be Rinoa. Finally, one DLC character is a returning veteran fighter, a woman, from the newer half of the series. From this we can deduce that from the above list Snow (FF13), Kam’lanaut (FF11) or Vivi (FF9) would fit the final two male newcomers, given that Zack isn’t from the right half of the series and the others would all be returning characters from the PSP games. It seems more likely it’ll be the former two – Snow and Kam’lanaut have more data hidden away in the files than Vivi, and notably both FF10 and FF13 only have one representative in Dissidia NT right now – most other games have two or three. That leaves the returning character as Yuna (FF10 series) or Prishe (FF11). The question is raised, then: what about the other characters? Gilgamesh, Tifa, Laguna, Prishe and Gabranth are all returning characters from the previous Dissidia games. Zack would be all-new. On top of that, one of Snow, Kam’lanaut and Vivi also won’t make it this DLC season. Fans expected the missing characters from the PSP’s Dissidia 012 to return eventually, but the fact there’s some data in the game suggests that Square Enix and developer Team Ninja got to planning these characters in earnest. A question is raised, however – Dissidia NT is almost entirely dead online, with the game seemingly having stumbled significantly after its fairly decent launch. I honestly wouldn’t have been surprised if the game didn’t get a second season of DLC because of this – but there’s also a successful arcade release in Japan that continues to see updates. The big question is what’ll happen going forwards: if these datamined characters will eventually show up in the game, and if they do if they’ll also make their way to console either as part of continuing DLC or as part of some sort of Street Fighter style relaunch of the game – which Dissidia could honestly probably use. Only time will tell. If you want to see more of the datamine, fans are still diving deep on it over on reddit.